The Career Profile for teachers of Design and Technology: Subject Competencies, has been developed to replace the Minimum Competencies for Trainees to Teach Design and Technology in Secondary Schools. Since 1995, revised versions of these competencies have been used by all those involved with Initial Teacher Education (ITE). They set out the skills, knowledge and understanding for the subject which has informed ITE course provision and subsequent inspection by Ofsted. This Excel-based resource sets out what is required throughout a teacher’s career, and assists in recognising the need for and informing decisions made about continued professional development. Teachers can record their level achieved against over 50 areas that they should be aware of, understand and be able to teach. A colour coded score helps to identify areas where improvements can be addressed. It also includes a section on The Leadership and Management of Design and Technology which identifies the skills, knowledge and understanding necessary for undertaking leadership roles in the subject. It also has space for recording CPD and personal details. Now that the models of training teachers have diversified, with the majority of trainees embarking on school led approaches through established HEI providers and over 600 Teaching Schools. Many have limited experience in providing D&T teacher education and few have D&T subject teacher training experts. Significant changes in the National Curriculum (2014) requirements and the review of GCSE and GCE examinations (2016) have meant there is a clear need for these competencies to be updated. The competencies have been developed to accompany the Teachers’ Standards which are used to assess all trainees working towards QTS, and all those completing their statutory induction period. 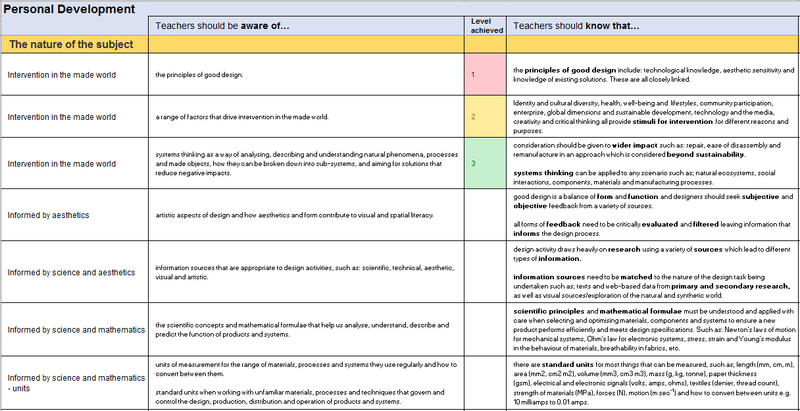 Taken together, these two set out an objective framework against which competency to teach D&T and associated development needs can be measured. This provides a useful addition to teachers’ professional career profile and will be useful for classroom teachers and subject leaders of all levels of experience. Don't forget to log in to get your membership prices. This item cannot be bought with Curriculum Credits.